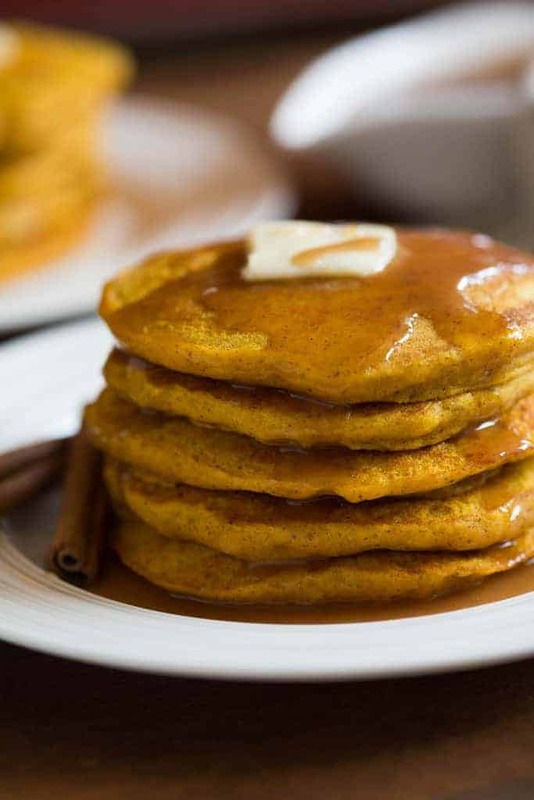 The BEST, light and fluffy Pumpkin Pancakes with a simple homemade cinnamon syrup. 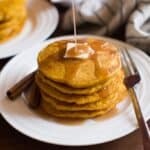 My all-time favorite pancakes during the fall and winter months. I love pumpkin! I love carving pumpkins, decorating with pumpkins, and especially eating pumpkin! Who knew that from one funny vegetable we could find so much entertainment?! I’ve also made it known that I’m a total breakfast person, and I can tell you in all honesty–with all bias set aside– that these pancakes are the A-MAZING. I would eat them all year round. Because who says pumpkin can only be enjoyed in the fall? 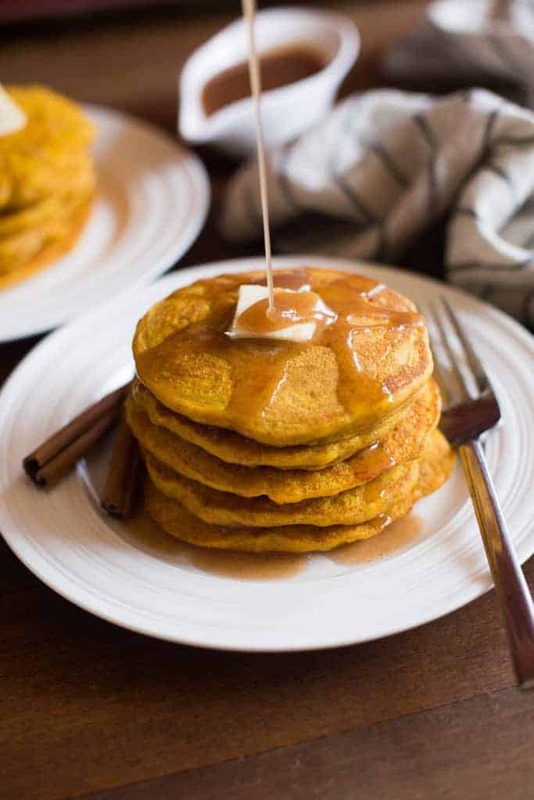 These pumpkin pancakes are so flavorful and moist and the cinnamon syrup puts them over the top! You’ve got to try them!! Start by mixing the milk, pumpkin, egg, oil, and vinegar. In a separate bowl, combine the dry ingredients. Then add the dry ingredients to the pumpkin mixture and mix it just enough to combine it, but be careful not to over-mix! Pour the batter onto your frying pan and cook them for a few minutes on each side! First melt the butter in a large saucepan. Then add the sugar, buttermilk, vanilla, and cinnamon and stir until smooth. Bring the mixture to a boil, cook it for 2 minutes, and add the baking soda. Honestly homemade syrup is so easy and so delicious that i’m guessing you wont ever buy syrup at the store again! Do not over-mix the pancake batter. Resist the urge to mix the pancake batter until it’s completely smooth.When you combine the wet and dry ingredients together just mix it to incorporate everything. It’s okay if it’s slightly lumpy with streaks of flour. If you mix the batter too much it causes the gluten to develop in the flour and your pancakes will be chewier instead of fluffy, like we want them. Do not pat down the pancakes. Another urge you may need to resist is using your flipping spatula to pat down on the pancakes while they cook. Don’t do it, or you’re “squishing” the air pockets that are helping make the pancakes light and fluffy. Do not flip the pumpkin pancakes more than once. Wait until you see small bubbles rise to the surface of your pancakes, and then it’s ready to flip. Just flip it ONCE and cook it on the other side until it’s done. It wont take long. 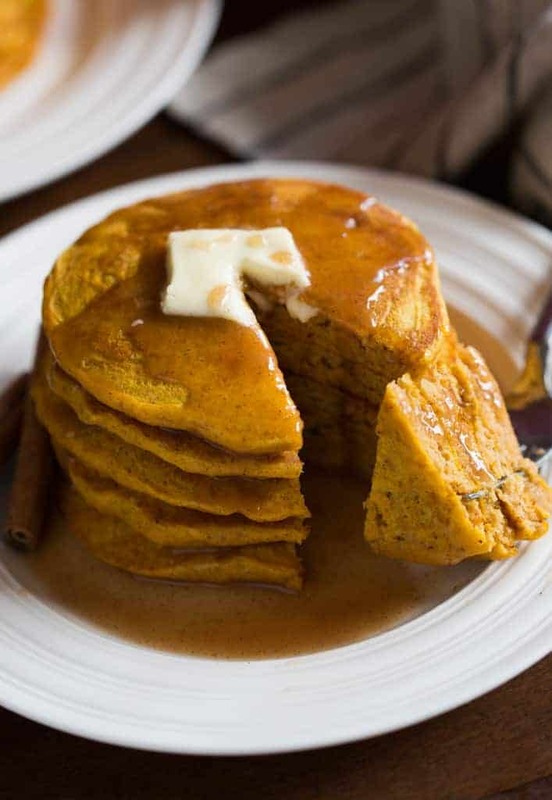 Light and fluffy pumpkin pancakes with a deliciously sweet cinnamon syrup. In a bowl, mix together the milk, pumpkin, egg, oil and vinegar. In a separate bowl,combine the flour, brown sugar, baking powder, baking soda, allspice, cinnamon and salt. Stir into the pumpkin mixture, just enough to combine. Stir in the sugar, buttermilk, vanilla, and cinnamon until smooth. Bring mixture to a boil. Once boiling, simmer for 2 minutes, stirring constantly. Add baking soda--it will cause the mixture to foam up. Cook for 30 more seconds and then remove from heat. Allow to cool for 10 minutes before serving -- it will thicken as it cools. Store leftovers in an airtight container, in the fridge, for up to 2 weeks. *Nutritional info does not include syrup. This recipe has become one of the few relatively healthy go-to picks that both my kids will eat. THANK YOU!!! We’ve been in a pumpkin mood and had these for dinner last night! They were so amazing I think I’ll make them again for breakfast in the morning. I didn’t have allspice so substitutes nutmeg! My two year old loved them! YUM! I cannot remember the last time my whole family ate the same thing for breakfast. These were devoured! I could not get them off the griddle fast enough. My kids have already asked for them again 🙂 Thanks! Is this the large can of pumpkin or the small can? The recipe calls for 1/2 cup of pumpkin. You can buy a small can and this recipe will not use it all. I love this recipe! I’ve altered it, made it exactly as its written, and my family loves them either way! In fact, I make banana chocolate chip pancakes and my son will not eat those with any other syrup than the recipe here! This syrup has become a family favorite and I always have some in the fridge! Thank you so much for sharing this recipe with us!